God came in peace and Bishop Odo’s reliance on the Pope’s Blessing is hypocritical at the very least. It is really all to do with power, the power of the Church and the power of Duke William. Both see the opportunity for riches and wealth. I’ve already heard the nobles carving up lands for themselves and looting and murder are all part of their game. No doubt they hope to buy their forgiveness, in the eyes of the Lord, by making large donations to the Church. There is no such thing as Norman goodwill. After the terrible events of the Battle of Senlac Hill, when the ‘flower of English nobility and youth lay dead’, the Norman Army spent yesterday scouring the battle field. If any Saxon was still alive it was a miracle, but they would not be long for this world. The murderous Normans made sure that no Saxon should ‘suffer’ a lingering death. They were like dogs after a hare- – Once they got the scent. Down the hill they ran, Faster And faster. But they just didn’t listen. We could see what would happen From the top of the hill. We knew what would happen At the bottom. They gave William the upper hand As we fell back to defend the King. And the word was given. Fall Back, Fall Back, To the Andreasweald, To the Malfosse. It’s late. It’s dusk. The Second Army’s here. At last. We join the line they’ve formed At Malfosse, at Malfosse we whisper. They are the dogs now after the hare, They have the scent of blood. For we can win, or we have Malfosse! And win we did. In the name of Harold and Saxon England. Horses and Normans piled high in the ditch. The ditch that was Malfosse. And then we disappeared, Into the night, Into the Andreasweald. May God Speed And Save Us All From Norman Rule. The Medievalverse Newsletter brings history alive with contributions from around the world. 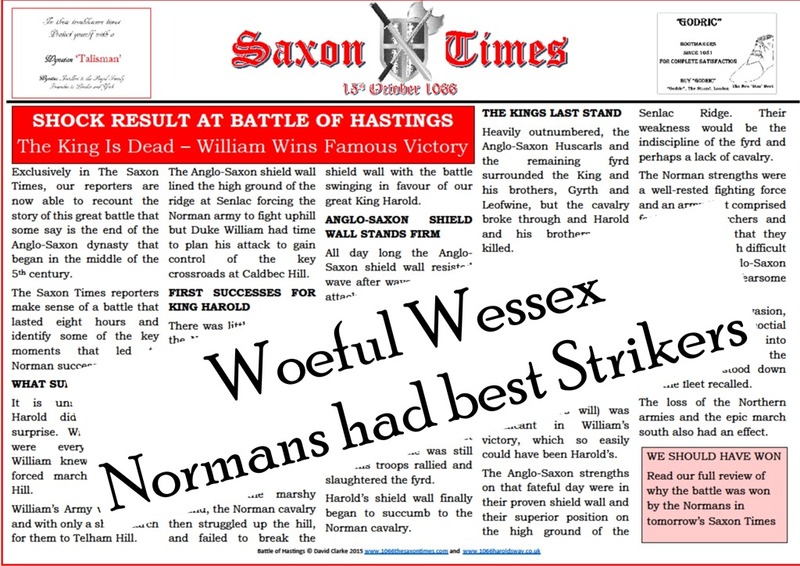 In the latest newsletter is a short review of The Saxon Times that highlights its use of a newspaper format to record the tumultuous events of 1066. Many of the troubles of modern day society are mirrored throughout 1066 with enough examples of invasion, terrorist acts and subjugation for comparison. That fateful year also can also be contemplated and argued as a lesson in business strategy and administration. 1066 is right on so many different fronts. 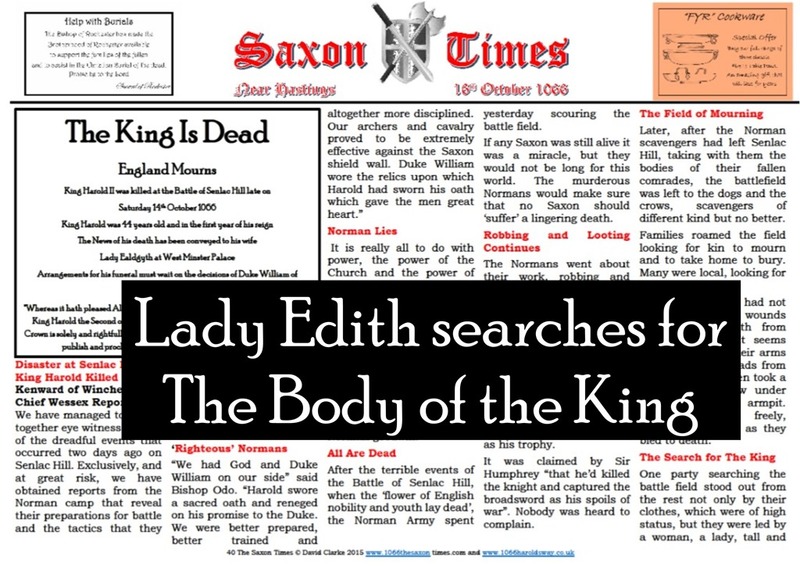 Writing The Saxon Times allowed for some fun stuff too; adverts, medical pages, cooking pages and a few insights from the ‘people’. Events such as the report by the BBC that the ‘Battle of Hastings sword failed to sell at auction’ and ‘the discovery at Lewes of the skeletal remains of a man believed to have been injured at the battle’ are all be woven into the fabric of the paper. Would King Harold II have been late for his own death? Long arrows, short arrows, broad and narrow arrows, even red and blue arrows. I was in the bookshop at Battle Abbey and every map in every book that I looked at about the Battle of Hastings gave a different view of the route that Harold took from London. There were arrows on a diagonal from London, aiming at Battle, four or five in a row as if a hail of arrows had been fired at William. There was a broad arrow creating a swathe across the south-east as the Saxon army passed over the land. I wrote the above in my introduction to 1066 Harold’s Way, a 100mile long distance walk from Westminster Abbey to Battle Abbey, inspired by King Harold’s epic march to the Battle of Hastings 1066. It appeared that the alternatives for King Harold on his march to battle was for his army to either take a more direct route, south east through the Forest of the Andreasweald, or march along the old Roman roads, east then south. The latter would have been a longer journey of over 90 miles rather than the 65 miles of the direct route and Harold was in a hurry. In my research for 1066 Harold’s Way, a Channel 4 documentary of the mid 2000s gave a thorough, logical and compelling argument for the alternative route along the existing Roman roads, east out of London along Watling Street and south along the clear Roman road towards Hastings, with the added legend of a camp at Rochester on the night of 11th October 1066. The Weald was a forest in Saxon times and hacking a way through the trees and over the highest parts of the Downs and the Weald, through Tonbridge and Tunbridge Wells, would have been a real struggle for the army. After Tonbridge, where the Roman road ended, the vast Andreasweald, the limited tracks, the climbs, descents and the glutinous Wealden mud would have debilitated any army. Even in the 18th century the Weald was declared ‘roadless’ and any journey took hours through the deepest clay imaginable (Cobbett). The Weald was not a traveller’s paradise. With the Roman roads still being used in Saxon times, there was a certain logic to the longer route – it followed the old Roman roads that led to the dock at Bodiam and on to the iron quarries around Beauport Park. It was a clear route through the forest to the ‘old hoar apple tree’ at Caldbec Hill. If the legend that Harold’s army camped overnight at Rochester is believed, it is possible that they stopped again on the route perhaps somewhere between Sissinghurst and Bodiam or at Bodiam itself as it would take time to cross the tidal Appledore estuary. After Bodiam, the route links up with the line of the old ridgeway towards what is now Cripps Corner where it would link with the trackway south through Vinehall Forest to Caldbec Hill. 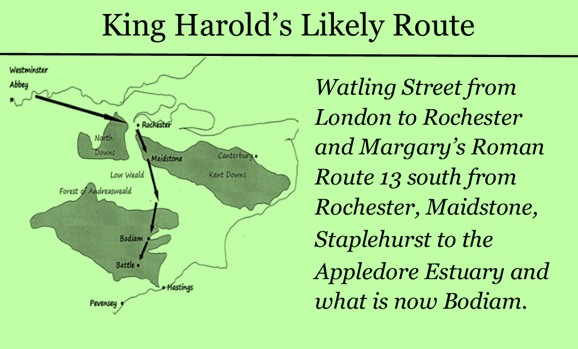 BBC History Today, in their September 2016 issue, published an ‘experts’ article on King Harold’s journey to Caldbec Hill, taking a simplistic view of the route from Westminster Abbey that ignored the conflicting views of scholars and historians. The Roman roads across the South-East still largely exist which contradicts their view that the roads are all gone. If they are in use now they would have been in use in 1066. Although the Rochester route was longer, the easier terrain would have provided a fast and less demanding route across the Weald with the army in a better state to fight a battle. I would suggest that a march south west from London would not be a route that would follow in the footsteps of King Harold. David is the author of The Saxon Times and 1066 Harold’s Way as well as other History Walks in Kent and East Sussex. Our next exhibition from 16th June will be ‘The Saxon Times’. 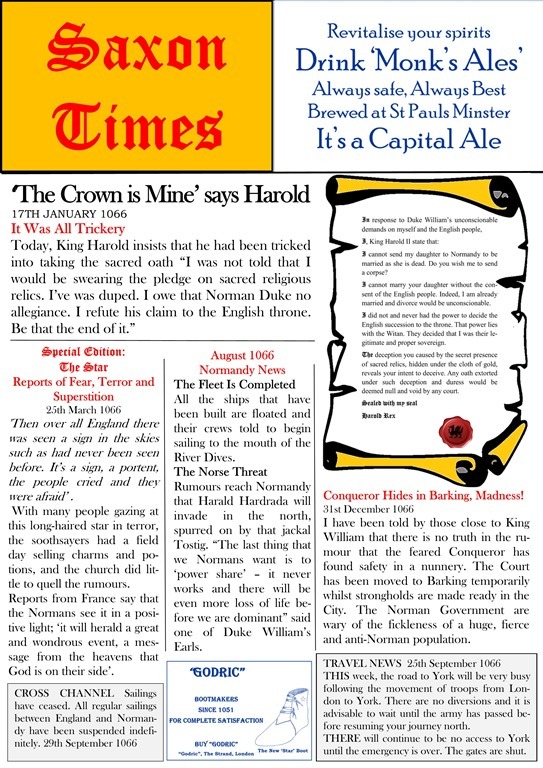 ‘The newspaper is a look at how the events of 1066 may have been reported and records eye witness reports of the events surrounding the death of Edward the Confessor, the coronation of King Harold II, the events that led to the Battle of Hastings, 14th October 1066 and the subsequent conquest of England through the eyes of The Saxon Times reporters’. The book is due to be published in August 2016 and promises a fascinating view into this most important period of the nation’s history. This is the work of David Clarke, who some of you will have heard talk on ‘Harold’s Way’ last year. David has also produced a series of walk booklets in and around Hastings and St Leonards which are stocked at the History House. We are grateful to David for the loan of the exhibition.